Who’s been eating the dodgy mince pies in London? 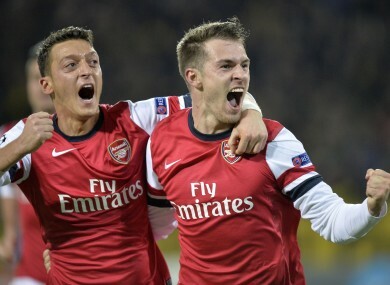 Mesut Ozil and Aaron Ramsey celebrate another day off work. FRESH AIR AND exercise was needed to clear my canine head after the clusterbomb that was the Premier League matches of 28-29 December. Manuel Pellegrini decided to rest every decent points accumulator he bought/inherited and Arsenal were hit with a Black Plague that ruled Ozil and Ramsey out of action. To make matters worse, Luis Suarez decided not to score for the second game in a row although he did flick on a scrappy assist for Martin Skrtel. It was the Everton boys that kept me from chewing the arm off the nearest sofa as Seamus Coleman scored another WOOF(!) wonder goal and Romelu Lukaku rediscovered his scoring touch. My points haul was a slightly better than average 45 even if my pox-ridden midfield only contributed four of those points. Pawing in my password this morning, I let out a yowl [half-howl, half-yelp] when I discovered that Arsenal’s German playmaker would be missing another festive fixture. He’s only been joined by Olivier Giroud on the sidelines and Cardiff are coming to London town. Cardiff! Vince Tan and his high, high trousers could be in for an uncomfortable afternoon so I’m more than tempted to bring in Theo Walcott. I felt like the genuine top dog earlier in the season when I signed Chris Whitaker and was rewarded with a couple of clean sheets. I’ve been checking the Norwich news wires and sniffing their tea leaves [in the alleyways behind Carrow Road] and the poor chap is M.I.A. If ever there was a time for a transfer wildcard I would heave him and Championship-dwelling Shay Given out the door. Captain, without a doubt, this weekend is going to be Suarez. He loves bullying teams in the lower reaches of the league but should have some fun against squarely mid-table Hull at Anfield. The appease the other half of Merseyside, we have Coleman, Lukaku and Ross Barkley. In defence, I am forced to keep faith with mu under-performing luxuries, Simon Mignolet and Branislav Ivanovic. How about a clean sheet to end the year lads? It should be an interesting gameweek as Chelsea, Everton, Manchester City and Newcastle United are all in-form and away from home. Other decent captaincy candidates would be Alvaro Negredo [rested up after Crystal Palace], YayaToure [ditto], Philippe Coutinho [if you can't afford Luis] or Santi Cazorla. I had a second transfer in the doggy bag this week so am backing Danny ‘golden boot’ Welbeck to notch a goal our two in place of stylishly absent Giroud. Here’s how we’re lining up. PS: Ciaran Clark, you picked a woeful time to get your Irish rump suspended. Email “Diary of a Fantasy Gaffer: Arsenal injuries and goal-shy Suarez ruin holidays”. Feedback on “Diary of a Fantasy Gaffer: Arsenal injuries and goal-shy Suarez ruin holidays”.